Welcome back to our blog. Pests are a common nuisance that can invade not only our homes, but also the storage areas, closets, and cupboards that are meant to keep our food safe. The thought of multi-legged creatures creeping and crawling on and around the food we eat is extremely unsettling, which is why it should be a priority for homeowners in the Piedmont area to be vigilant about taking steps to protect their pantries from insects and other pests. While our pest control team at Ray Pest Control will always be there to exterminate any bugs from your home, there are simple steps you can take to safeguard your kitchen storage spaces from invading bugs. Keep reading below to learn more. These are the most common pantry pests who tend to invade food bags and boxes that hold flour, rice, grains, cereal, spices, and other pantry foods. While they often make their way into your pantry by way of the packaged food, they enter the home in a variety of other ways, too. One way to keep unwanted pests out of your kitchen spaces is by properly sealing windows. This could be as simple as making sure the window screen fits snugly into its frame to repairing holes and tears in your screen. Keep in mind that bugs can fit through the tiniest of spaces, so even in a miniscule gap between your screen and frame can lead to a bug infestation. If your screen is damaged beyond repair, you’ll want to replace it with one that is free of any rips or holes. If you can’t repair or replace your screen, make sure to keep your window closed until you can do so. Additionally, you’ll want to ensure that your window closes and seals properly and to make any necessary repairs if it doesn’t. “A clean and organized pantry is a healthy pantry”—isn’t that how the saying goes? Either way, keeping an organized pantry, closet, and/or cupboard in the kitchen is one of the best ways to protect your food from pests. When your pantry is neatly organized you can clearly see what may be lingering around your food containers. You can also see signs of bugs or rodents much better when your pantry is free of clutter. An organized pantry is also more likely to be much cleaner with fewer spills and messes that may attract common pantry pests. If you do notice any spilled foods, spices, or other ingredients in your cupboard or pantry, clean it up immediately to avoid a bug infestation. If you notice movement in your pantry foods, either in or around your food, call Ray Pest Control right away. Our pest control company can get rid of your pantry pest problem in the safest, most efficient way possible. 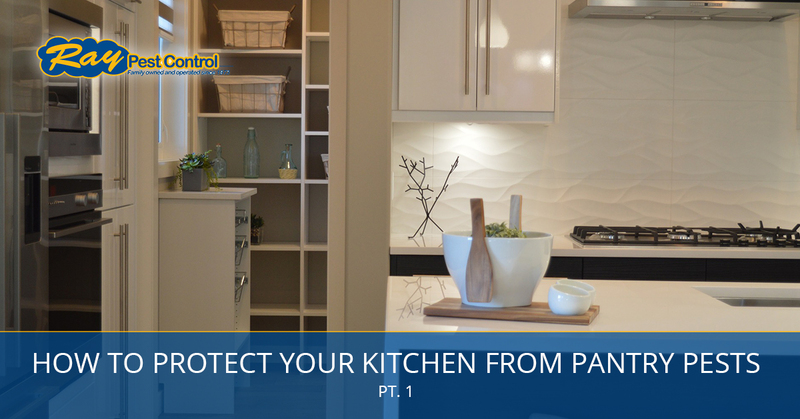 Join us next time as we continue looking at more useful tips for keeping your pantry free of pests.